The MPX-90M is a modified version of the original MPX-90. It has been retrofitted specifically for direct part marking UDI barcodes or QR codes on medical devices and implants. Due to the FDA’s new mandate, which will require these devices be marked by law, the MPX-90M is a must for all medical device manufacturers, distributors and hospitals. The MPX90M impact printer can mark 2D GS1 DataMatrix barcodes and QR codes as tiny as 1mm squared. This method can imprint unique device identification (UDI) numbers quickly and affordably, allowing for easy tracking and traceability for compliance with new FDA UDI regulations. The Roland MPX90M features a small footprint of 11.3in (W) x 15.1in (D) x 12.2in (H) [286mm (W) x 383mm (D) x 308mm (H)], making it the most practical and compact solution available. There is no need to complicate things by using a high powered CO2, fiber, YAG or YV04 laser. Contrary to a laser system, the MPX-90M does not require special power, a vacuum system or ventilation. It is designed to interface with a USB connection to any PC or laptop and operated by the everyday person. Because it does not burn or remove material on impact, the MPX-90M generates no odors or debris. Best of all, there is no daily maintenance required! To top it off, the MPX90M UDI impact printer produces a depth of 30-microns which will assure that barcodes will not be affected by scratches. The marking is permanent, medically safe and will not corrode or degrade materials over time. Engineered for speed and precision, the MPX-90M can quickly imprint up to 26 digits of information inside an area as small as one square millimeter. What more can anyone ask for? With the world becoming a smaller place, developing a standard system for identifying and tracking medical devices is long overdue. The Food and Drug Administration (FDA) is rolling out a series of regulations in 2012 in hopes to create a standard that not only the US, but the entire world can follow. One of the key elements is through the development of a Unique Device Identifier (UDI) on all medical devices. The primary goal of the UDI System is to increase patient safety by marking medical devices; particularly surgical tools and implants, with a GS1 data matrix or QR code that can then be scanned and identified. A particular area of concern is that often times the manufacturers of such devices issue recalls when a device is deemed defective or unsafe. The Food and Drug Administration (FDA) is in charge of overseeing this process, which is where they come in. Currently, only about 53% of recalled medical devices are ever recovered, mainly because there is no standard system in place for manufacturers, distributors or hospitals to locate the devices being recalled. Over the last few years, several firms were unable to correct or remove devices that were categorized by the FDA as high-risk recalls, some of which could have resulted in serious health consequences for patients or even death. By creating a way for medical devices to be traced and recovered, the new regulation will not only increase patient safety, it will also provide the FDA with the opportunity to use recall data to identify the common factors that lead to devices being recalled in the first place. In addition, UDI will reduce a Hospital’s cost of replacing lost or missing surgical tools due to central and offsite sterilization centers where multiple surgical tools are mixed up and misplaced during the sterilization process. In short, UDI provides an easily accessible source of device information for patients and clinicians and improves the following areas of interest as well. Over the years, Roland has been known for leading the industry in printing and marking technology. One of the methods they pioneered was impact printing. The Roland photo impact printers were originally designed for placement in the gift and jewelry industries. The intended function of the METAZA impact printer was to imprint photos, text and logos on pendants, dog tags and various gift items. Contrary to engraving, the impact printers strike downward with a diamond tip stylus, creating a slight indentation into the material. Compatible materials range from plastic and acrylic to stainless steel, iron, titanium or any other metal up to 200 Vickers hardness. The harder the strike, the brighter the impression is left behind. Remember the first dot-matrix computer printers that were introduced back in the old days? This method is similar; however, there is no ink used. The unique ability to imprint a gradation of tiny dots; which varied in brightness, resulted in the smoothest transition between tones, superior to any other method offered on the market. With four different print modes to choose from [Text (262 dpi), Photo (353 dpi), High Resolution (529 dpi) and Vector (1058 dpi)], the Roland photo impact printers combine photos, text and vector images for attractive, everlasting results. Impact printing has proven to be the most efficient and cost effective method of marking metals and plastics. Initially, imprinting photos on jewelry and pendants was the main reason one would purchase an MPX-90 impact printer. With UDI on a rise, this is no longer the case. The Roland MPX-90M impact printer offers some very generous printing capabilities. The new adjustable XY vise and clamping table were designed for securing both flat and odd shaped medical devices; such as scalpels, forceps, tweezers and other surgical tools in place. In addition, the built in laser pointer is used to locate the center of the material to ensure the graphic is imprinted accurately. Since there are no obstructions to the front or to either side of the machine, you can load materials of infinite lengths with the cover open. With the cover closed, you can load materials on the clamping table measuring 3.94in (W) x 7.87in (L) x 1.57in (H) [100mm (W) x 200mm (L) x 40mm (H)]. With the vise installed, an item with a height of 0.8in (20mm) can be accommodated. Lastly, the Roland MPX90M “floats” the print head which allows you to print along curved surfaces by resting the engraving head on the material, thus allowing it to follow a curve. A special plastic nosecone is used to ensure the item is not scratched. This is an excellent feature for marking QR codes on medical alert tags and medical ID bracelets as well. Perhaps the best feature to point out about the Roland MPX-90M impact printer is its ease of use. Anyone with no prior experience can setup and run the MPX-90M with no problem at all. The Roland MPX90M connects directly to your PC or laptop via a USB cable. It supports Windows XP/VISTA/7 (32 and 64 bit editions) and is compatible with Adobe Illustrator, Photoshop and CorelDraw. Included with the machine is Roland’s METAZA Studio software. METAZA Studio allows you to import photos and images in AI, EPS, JPEG and BMP formats along with data acquired from compatible scanners and digital cameras. You can then modify your image, remove backgrounds and insert premade borders and frames. Complete your design by adding any True Type font text from your computer. The most exciting new feature introduced with the Roland MPX90M is its ability to convert numerical data to 2D DataMatrix barcodes and QR codes that meet GS1 standards along with other formats. No longer will you need to import codes generated from other programs. All your code generating can now be performed from within METAZA Studio in a few easy steps. 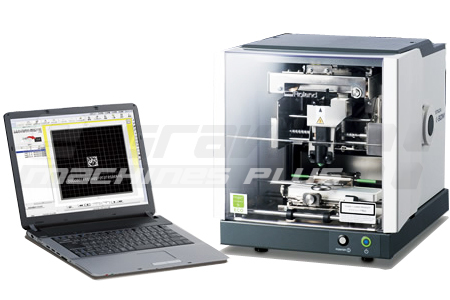 Introduced with the release of the MPX-90, Dr. Engrave software is also included with the MPX-90M. 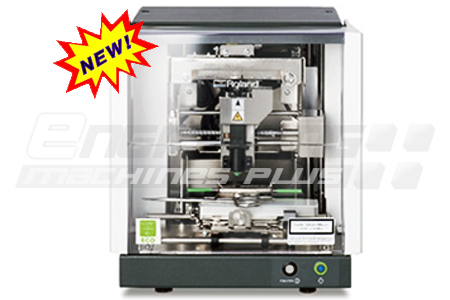 Dr. Engrave software is most commonly used with Roland’s EGX engravers. Its primary function is to design templates for engraving multiple data plates, ID tags, badges, and nameplates. Dr. Engrave features the ability to import databases in TXT or CSV formats for variable data applications. In other words; if you have 50 tags to make and the information on each tag is different, you can create a list with all of your data in Microsoft Word, Excel or Notepad and then import it directly into Dr. Engrave. The result, design one tag and import the rest rather than designing 50 individual tags, one at a time. Furthermore, Dr. Engrave features a serialization function as well. In this case; if each tag had a serial number on it that increases sequentially, all you would do is setup the first number on the first tag and program it to increase by X amount on tags 2 – 50. Talk about productivity, this sure beats typing in each serial number one by one! When it’s all said and done, simply send your job to print. The MPX90M will pause after each plate is completed so that you can reload it with material and carry out a seamless production run. Variable data printing automates the serialization process, making it easy to mark each tool manufactured with a unique barcode, serial number and production date. Once again, Roland has paved the way with a new and complete UDI/direct part marking solution. Never has there been a better time than now, to begin making the transition to adopting a standardized method for tracking and tracing medical devices and implants. The word is out and the bar is high. Let us help you meet the challenge and become compliant. Order yours today! -Compatible with Microsoft Windows XP, Vista and 7 operating systems (both 32bit and 64 bit). -Not compatible with Apple/MAC operating systems unless run in virtual PC mode. -Pentium® 4, 3.0 GHz or more recommended. -512 MB of RAM or more recommended. -25 MB of free hard-disk space required. -1 available USB port required. Roland engravers have earned a worldwide reputation for reliable performance and outstanding results. Like all Roland products, they come with an international ISO certification. This signals Roland’s commitment to offering top quality products backed up with first-rate customer service and a wide variety of supplies and accessories. The Roland MPX-90M is backed by a one year warranty. An extended warranty is also available upon request. 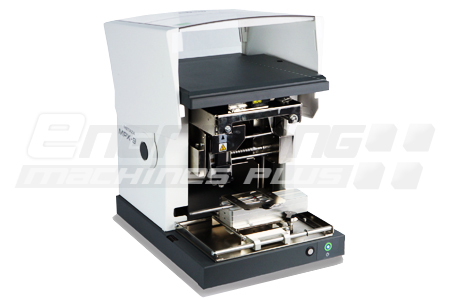 Setup of the MPX-90M was a breeze, Danny Martinez at Engraving Machines Plus was very helpful in the purchase and setup of the unit. © 2016 Engraving Machines Plus. All Rights Reserved.